Little Bill the Producer - This lesson (from EconEd Link) teaches the most basic vocabulary about production. People who make goods and provide services are called producers. Norman Rockwell's Curiosity Shop - match the good or service. 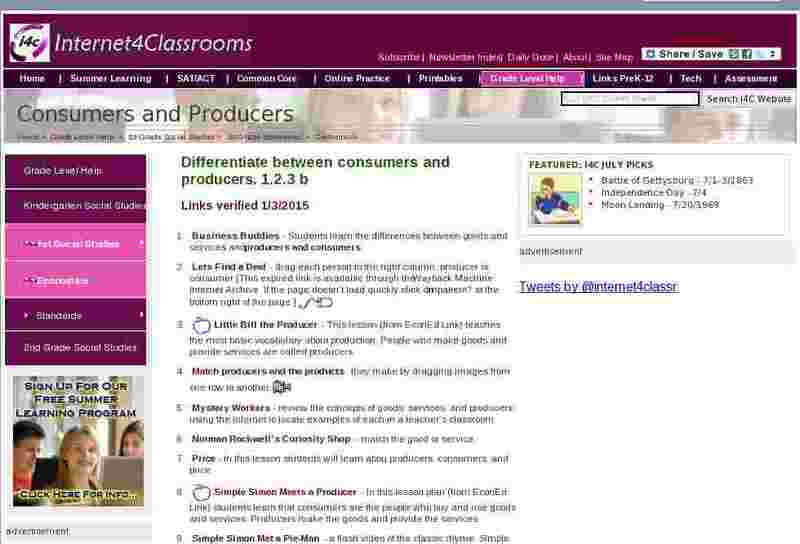 Price - In this lesson students will learn abou producers, consumers, and price. Simple Simon Meets a Producer - In this lesson plan (from EconEd Link) students learn that consumers are the people who buy and use goods and services. Producers make the goods and provide the services. Simple Simon Met a Pie-Man - a flash video of the classic rhyme, Simple Simon and the Pie-Man, introduces students to the concepts of consumer and producer. The Goat in the Rug - An Economics and Literature lesson which explains the use of items to produce goods. To Market To Market - This lesson will help students become good consumers and producers by taking turns buying and selling thing in a classroom-created market. We are Consumers and Producers - In this lesson (from EconEd Link) students learn how they and family members fulfill the roles of consumers and producers at home and in their community.